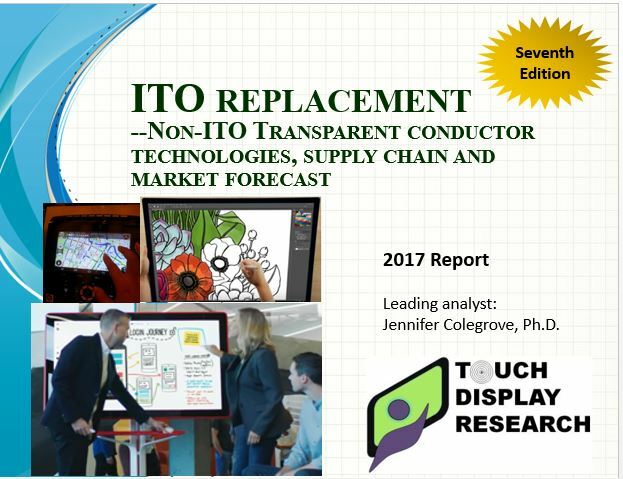 Advanced transparent conductor for touch screen, display, smart windows and other markets - Touch Display Research, Inc.
Santa Clara, California, April 3, 2017—In the recently published “ITO Replacement—Non-ITO Transparent Conductor Technologies, Supply Chain and Market Forecast 2017 Report”, seventh edition, Touch Display Research profiled over 300 companies and research institutes working on advanced transparent conductive (TC) materials. The report provides a detailed analysis of metal mesh, silver nanowire, carbon nano tube (CNT), conductive polymer, graphene, and other technologies. This report provides not only the outlook for ITO-replacement, but also analysis of the biggest changes in the ITO-replacement industry from 2013 to 2017, and predicted 2017 winners. CES 2017 ITO-replacement exhibitions are included in this report. Why have some ITO-replacement companies failed? What are the issues with metal mesh and how have some companies solved those issues? What are the issues with silver nanowire and how have some companies solved those issues? Business strategy recommendation is provided in the report. What are automotive companies’ views on ITO-replacement? Chapter 17 includes non-ITO touch sensor penetration rate in mobile phones and tablets, NB and tablet hybrid PC, AIO and desktop monitors and automotive touch market. 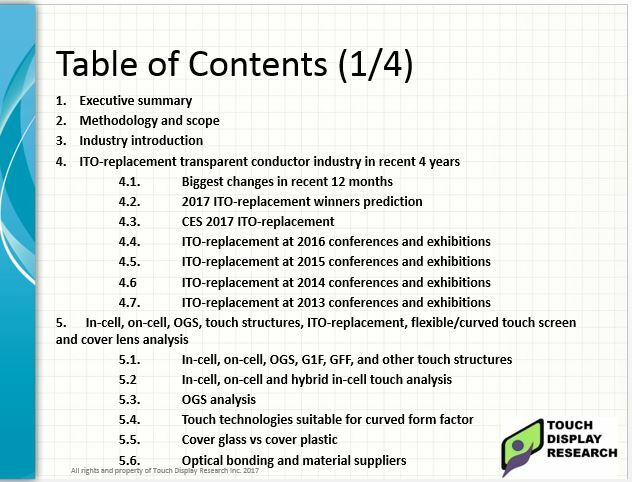 Colegrove, author of this report, performed first-hand surveys and interviews with hundreds of ITO-replacement suppliers and OEM/ODMs in the last 10 years. Over 300 companies and research institutes are profiled and supply chain analysis with many companies is provided. Major OEM/ODM brands’ adoption of ITO-replacement and ITO-replacement touch devices are provided in the report. This report provides a regional analysis for the U.S., Japan, Taiwan, Korea, China, Germany, the U.K., and other countries. Market data in the report includes 5 years history data: 2012- 2016 and 8 years forecasts from 2017 to 2024. The market forecast includes non-ITO touch sensor unit, Area (square meter), ASP ($/m2) and Revenue, with detailed breakdown by six TC technologies. • Touch Display Research experts have been writing comprehensive reports on metal mesh, silver nanowire, conductive polymer, carbon nanotube and touch industry for over 10 years. You can purchase and receive the report today. Touch Display Research, Inc. (www.TouchDisplayResearch.com) is a technology market research and consulting firm specializing in touch screen and emerging display technologies such as OLED displays, quantum dots, flexible displays, e-paper displays, ITO-replacement, Active pen, near-eye displays, pocket projectors, gesture controls, voice controls, and eye controls. Touch Display Research helps technology companies grow and connecting their technologies to the marketplace. We were the first company to publish Quantum Dot market reports, the first company to publish Active Pen market report, and ITO-replacement market report. We have always been there to analyze new and emerging technologies. Touch Display Research provides reports, consulting, and due diligence to touch suppliers, display manufacturers, consumer electronics ODMs/OEMs, material suppliers, investors and venture capitalists. We are member of Flextech Alliance, SEMI and SID.